You know the challenge to provide current and well written editor documentation, don’t you? Probably you are tired in writing MS Word documents, converting them to pdf, sending them around via e-mail and knowing, at the same time, that nobody will read it. 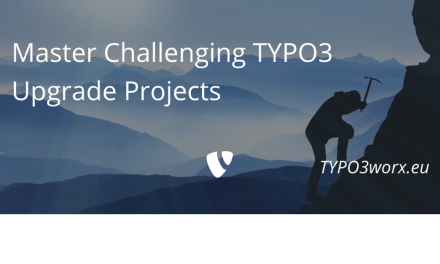 In this post I will show you a solution with which the editors will have it right at their fingertips, when working in the TYPO3 backend. It will be also a good location for spreading editor and TYPO3 related news, especially if it is used as the module, which is instantly loaded after the backend login. If you are in doubt whether this tutorial is something for you, because you are an integrator with basic php knowledge. Trust me, using this tutorial you do not need much (any?) php knowledge. So … these few following steps are necessary. You do not have to type all steps manually. At the end of the post is a zip file which contains all necessary files and folders. Usually you will do it using the EXT:extension_builder, but in this case the creation of some folders and files is sufficient. The extension_builder would be overkill. If you are already using a template layout extension, this structure will be already there. You can use this, but you have to replace several strings later. In most cases it will be the extension key. # Extension Manager/Repository config file for ext: „customer_docs"
The second file, you must add, is a gif file named „ext_icon.gif“, which resides on the same level and is the icon which will be displayed in the extension manager and in the module menu. At this point you can already go to the extension manager (EM) and activate the extension. This enables another icon in the EM, where you can set the pid where the documentation will reside. If you have this extension in the version control system and you want to deploy it, you can set the pid already in the code. But you can overwrite it in the TYPO3 backend via the EM later at any time. To achieve this you need to create a the file „HelpController.php“ in the folder „customer_docs/Classes/Controller“. You must replace “MyNameSpace” with the name of your namespace. A good possibility is using a combination of your first- and lastname. In my case it would be “MarcusSchwemer”. The controller takes the configuration as an argument an passes it on to the template, which will be created in the next step. Further settings or adjustments in these files are not necessary. For a proper display of the module labels language files in xlf format are required. Create a file “typo3conf/ext/customerdocs/Resources/Private/Language/locallang_customerdocs.xlf“ and add the following content. If you want to add another language, just create another file in the same directory with a prefix for the language followed by a dot. 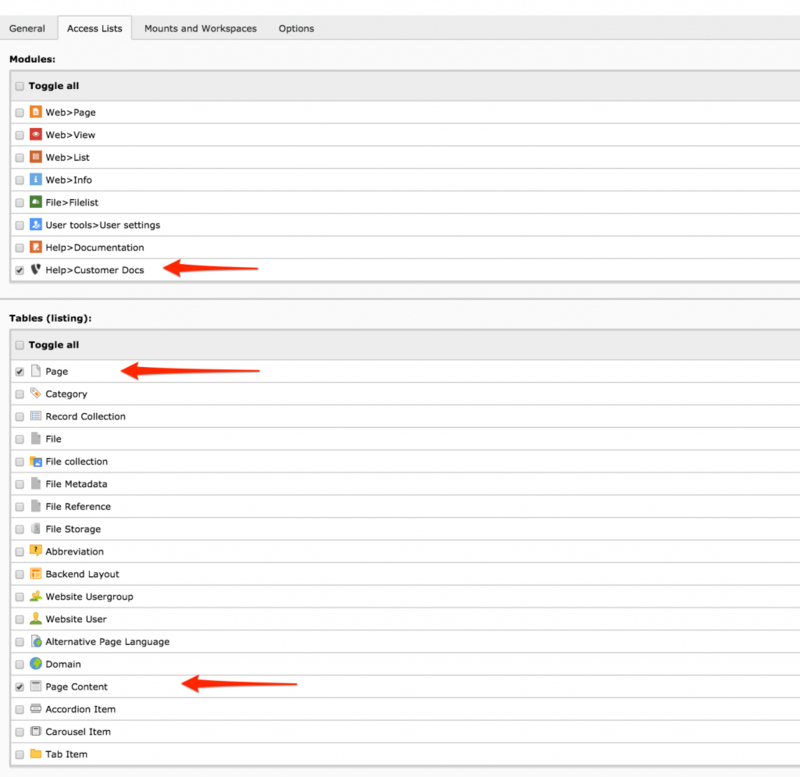 For example „de.locallang_customerdocs.xlf“ for german. Now it is time to register the backend module and make TYPO3 display the module in the help section. This is done in the file „ext_tables.php“, which is also located in the root folder of the extension. Please create the file and add these lines. Please change the string “MyVendorName” to something individual. The last technical step to enable the module for the editors and to provide the database mount. This should be done in a separate group, which can be added to any other group or user. Creating the module was really easy … nine reproducible steps. But now the comes the hard part … Creating the editor documentation. I know, this is not a task everybody likes. But see it like this: Using this kind of editor documentation is also some kind of quality assurance. If you provide a step by step instructions and templates of content elements, which users can copy, paste and modify, you prove yourself (and the customer) that your work works. Maybe it’s the best if you start with this module and add documentation step by step, when a feature is ready to. So it is not “the big documentation“ task at the end. I wish you now happy coding and documentation sessions! Sounds I have to test that out definitely. Great tut. I think user documentation is a must.